Most cross country courses include various types of cross country obstacles used in equestrian eventing and we thought a few pointers on how to deal with them would come in handy. 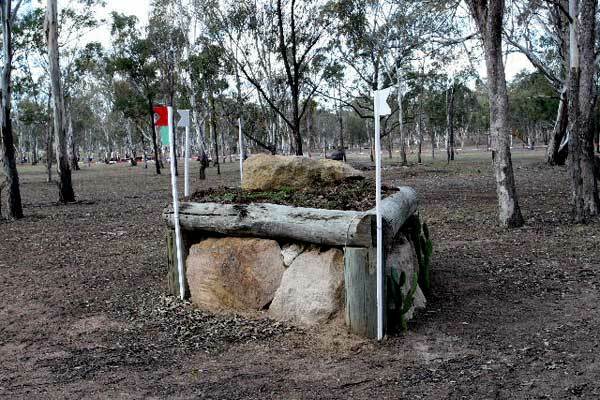 Modern eventing competitions include a wide variety of cross country obstacles and, as event riders are becoming better and better, the course designers are incorporating more and more unusual obstacles and decoration. However, the basic obstacle types remain the same and most if not all, cross country obstacles can be categorised under one of the following types. Arrowhead fences are cross-country obstacles found in eventing. They require a great deal of accuracy, due to their narrowness. As their name suggests, they are triangular-shaped fences built with the "point" to the ground. They are rarely wider than a few feet. Arrowheads require the horse to be straight between the rider’s hands and legs. A brush fence is an obstacle in cross-country and steeplechase events, as well as in steeplechase racing courses. It consists of a solid base with brush sticking out the top. The fence is meant to be brushed through, in a flat jump, rather than the horse making a rounded arc over it. The bullfinch is similar to the brush fence, but is designed with higher sprigs of brush so that the horse cannot see over it. The coffin is a combination jump and involves jumping a set of rails, with one to several strides downhill to a ditch; and then one to several strides uphill to another set of rails. Coffins used to be more pronounced in their change of terrain, with a drop down, to a ditch, then a bank up. However, the narrow ditch and rails type is usually the only coffin seen on modern courses. Banks are steps up or down from one level of land to another. There may also be a "staircase" of banks to be ridden up or down. Banks up – need a great amount of impulsion from the horse, rather than speed. Drops (Banks down), should be approached slowly, with minimal impulsion, as a horse that launches off a bank will land further down the slope stressing its legs, or it may have trouble striding to a fence on the landing side of the bank. The bullfinch is a type of cross-country fence seen in eventing. It is made up of a solid base, with bush on top that is several feet high and is meant to be jumped through, rather than over. A combination may include all sorts of logs, banks, water, and ditches and an obstacle becomes a combination when two or more fences are placed within 1 to 3 strides of each other. Combinations are regularly included and the good cross-country course designer knows how to manipulate the distances and the types of obstacles to make them more difficult. The combination is always considered one obstacle, and the various elements within the combination are usualy lettered A, B, C with the obstacle number(ie. 10A 10B 10C). A refusal at any of the component parts means the horse has to repeat the entire combination.However, despite being treated as one obstacle, each part can result in separate penalty points if knocked down. Therefore, if each of three fences in a triple combination were knocked down, the rider would receive 12 faults (4 per rail), instead of 4 faults for the entire obstacle. The course designer may shorten or lengthen the distance from the usual 12′ stride. The most extreme case is when the designer puts enough room for a half-stride, in which case the rider must shorten or lengthen according to the horse’s strengths. At the lower levels, the designer will not change the distances from what is considered "normal" for the combination. Riders must adjust their horse’s stride according to the type of obstacle that must be jumped, and the order they occur. For example, a vertical to oxer rides differently from an oxer to vertical. Horses take off at different distances from the obstacle depending on its type: usually closer for triple bars, slightly further for oxers, and even further for verticals. Other factors, such as a "spooky" fence or a liverpool, may change the distances for particular horses as they back them off. The higher the fences, the less room there is for error. At the lower levels, the designer may make certain elements in the combination slightly lower, to make it easier. Fence height also has some imfluence on the horse’s take-off distance, although this is only a great variant when the fences are 4’6" or higher. To successfully negotiate a combination the rider must maintain rhythm, balance, and impulsion as they approach the obstacle. 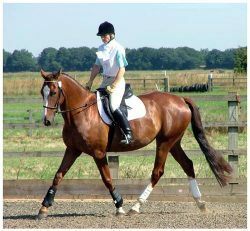 The rider must have a good understanding of her horses stride length, must know how much to shorten or lengthen for each particular combination. Before riding a course, the rider should walk the distances in the combination and decide the stride needed for their horse to jump it. 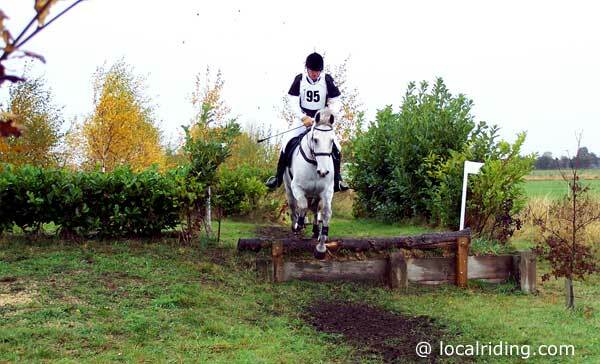 A corner can also be called an apex, and is regularly seen on the cross-country phase of eventing. Similar to a "fan" jump seen in show jumping the fence makes a "V" shape, that can have an angle up to 90 degrees. The corner is a real test and is meant to be jumped on a line perpendicular to an imaginery bisecting line to the angle. If not fully committed the horse or rider may run-out at a corner. Ditches are commonly seen on cross country courses at all levels, and may be up to 11’10" wide at the advanced four-star level. A ditch tests the bravery of the horse and the rider, and may be used alone or in a combination. They can be used in a coffin, in front of or after a fence and underneath as in the trakehner. A ditch should always be ridden forward, positively. The rider should never look into the ditch, and should keep their focus up and ahead. A drop fence is a common obstacle on cross-country courses. 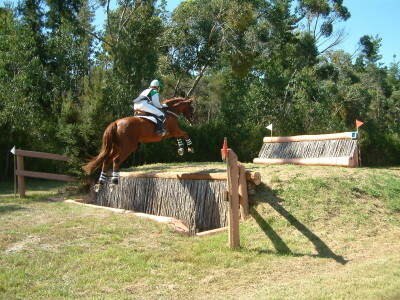 It is a bank-style jump with a log fence at the take-off, requiring the horse to jump the fence then land a step lower than the take-off. A drop fence may be used as part of a combination or as an individual obstacle. When approaching a drop fence, the rider should slow the horse down to prevent it launching off the bank, but still maintain enough momentum to get over the log. If the rider slows down too much, the horse will refuse or catch the log on takeoff, resulting in a fall. Log built fences and obstacles can include verticals, oxers, triple-bars and log piles. They present a quite natural picture to the event horse and a solid but quite intimidating obstacle. A roll top is a cross-country jump with a rounded half-barrel appearance. Roll-tops can be quite wide at the upper levels and generally demand respect from the horse, but are often not considered a "scary" fence for horses. Rolltops are used in show jumping, or in the hunter classes, generally split in half so the rounded appearance is only from the front and flattened on the back. A sunken road is normally found on large cross-country courses. It is a combination type fence involving banks and rails. At the lower levels, it may simply consist of a bank down, with a few strides to a bank up. At the upper levels, the sunken road can be quite complicated, usually beginning with a set of rails, then one stride or a bounce before the bank down, then a stride in the bottom of the road, before jumping back up the bank and into another stride or bounce before the final set of rails. Sunken roads are very technical, especially at the upper levels and require accurate riding. 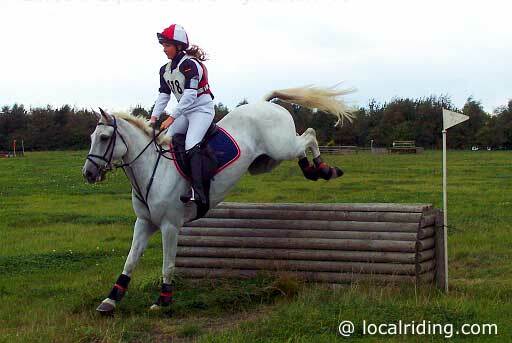 A bad approach or extravagant jump-in can ruin the riders distances resulting in a stop or a fall. The trakehner is found on most cross country courses. It consists of a rail over a ditch. The ditch can be frightening for the horse and so, is a test of bravery. 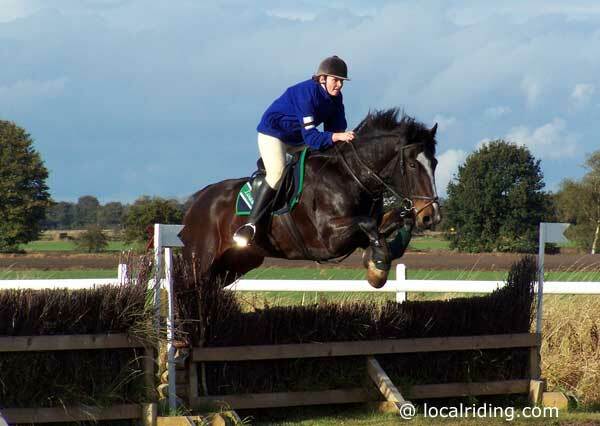 Small trakehners are introduce at training levels but, at the higher levels they can be very big and very frightening. Trakehners were originally fence-lines that that had been built in drainage ditches. The Trakehnen area of East Prussia, originally wetlands, was drained by the Prussian kings in the 17th and 18th centuries, just before a national breeding program was started. The Main Stud at Trakehnen, produced the Trakehner breed of horse and was established on the land in 1732. The large drainage ditches were used to test for 3-year-olds for suitability as war mounts. In 1973, Rachael Bayliss and her horse, Gurgle the Greek, cleared a trakehner at the Badminton Horse Trials by going under it. The rules were changed and now require the horse to pass between the flags and over the log. 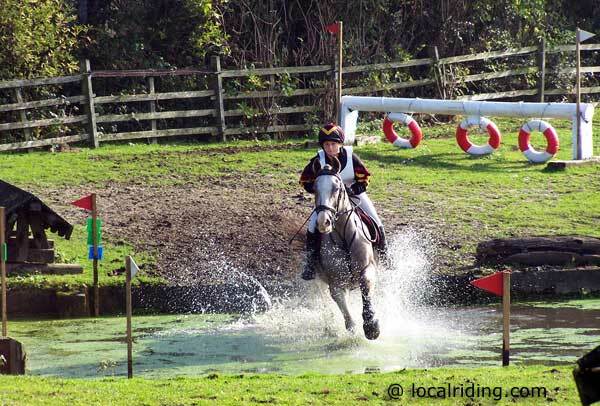 Water is a popular inclusion on the cross-country course and a water complex can be as simple as a water crossing, or a complicated combination involving several jumps into and out of the water. No matter what the eventing level, the footing of the complex should always be firm, and the competitor should walk into the water when walking the course to test the footing and the depth of the water. If your horse is reluctant to enter water you will have a problem at almost every event you go to. USEA rules state (2005) that water may be no more than 14" deep. Water crossings often include a bank or, at higher levels, a drop fence into the water. There may be a fence or a bank complex in the water, and a bank out, possibly to another fence. S There is generic zovirax tab a lot that guy can make for..